Square truss in 6082-T6 alluminium alloy, main tube Ø 50 x 3 mm, diagonal tubes Ø 25 x 2 mm. 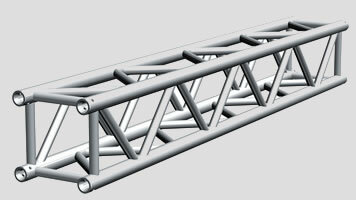 Twist resistant truss. Double trunk-conical shaped spigot, quick pin and “R” clip are the best solution for high loading capacities. The wide range of accessories makes the product versatile both in a professional sphere and in situations where endusers need to rig heavy equipments (service organizers and show business operators). Main Tube: Ø 50x3,0 mm. Diagonal Tube : Ø 25x2,0 mm.